COMPOSITION:Each vial contains 10ml of solution containing Fluorouracil USP 500mg (50mg/ml). 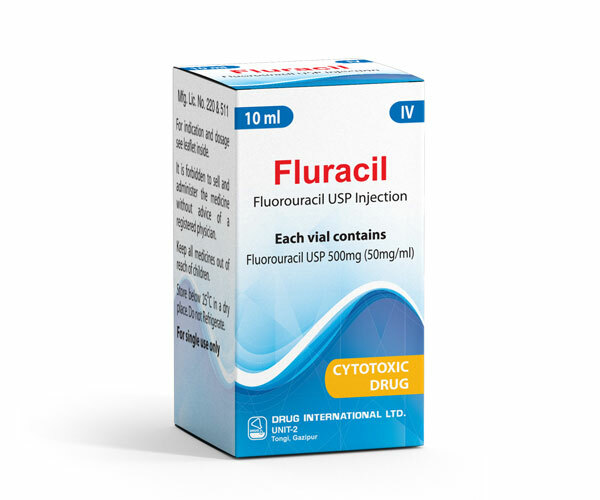 Intravenous 5-fluorouracil can be delivered by rapid intravenous bolus injection or slow infusion. The vial contents can rapidly be injected directly into a peripheral vein,the commonest schedules being: 12-13.5 mg/Kg (500 mg/m2) daily for 5 days repeated at 4- weekly intervals. Slow intravenous infusion requires the drug, to be diluted in 500 ml of dextrose 5% solution, then infused over 2-3 h on 5 successive days. Or, as directed by the registered physician. Please see prescribing description for more information. Fluorouracil is contraindicated throughout pregnancy. The literature pertaining to pregnancy and cytotoxic drugs is necessarily limited but it appears in general that risk of teratogenesis diminishes with the advancement of pregnancy. Therefore most cytotoxic drugs are absolutely contraindicated in the first trimester and 5-fluorouracil, used in the first trimester has been reported to cause multiple congenital abnormalities. There are many case reports, however, of pregnancy being conducted successfully with combination chemotherapy being given to the mother during the second and third trimesters. Because of the age of the population and the natural history of the tumors treated, most of the data on longterm follow-up pertain to therapy for leukemias. More data need to be accrued on the subsequent development of neonates before it is certain that any of these compounds are free of late effects. Each box contains one vial of 10ml solution.